our business have complete government permits. why trust your homes to underground business? Book and enjoy a quality massage right at the comfort of your home. You deserve it! 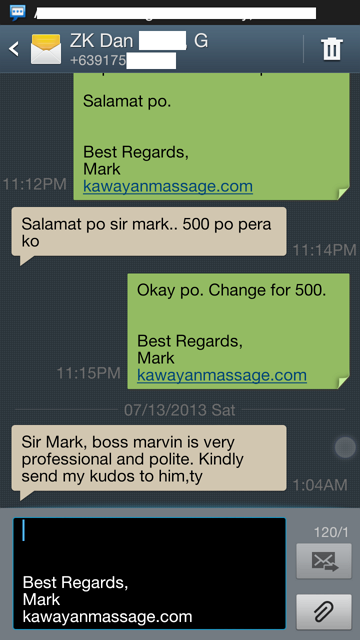 We charge Php 250.00 per hour on any type of massage. We service the entire Quezon City and nearby areas from 3PM to 3AM daily. We do Swedish, Shiatsu, or Combination of both, with a choice of Peppermint Oil or Floral Lavender Oil. Our licensed masseuses (female masahistas) are NC II passers and TESDA certified. Male masahista is also available. Our business is family oriented, and we keep our business clean and professional. Strictly massage. Thank You Network Labs (NSN)! We were up early today. To provide quality massage to Network Labs employees. Relax and soften injured, tired, and overused muscles. Get a Home Service Massage today. Some more feedback from our clients. Have a blessed Sunday everyone. 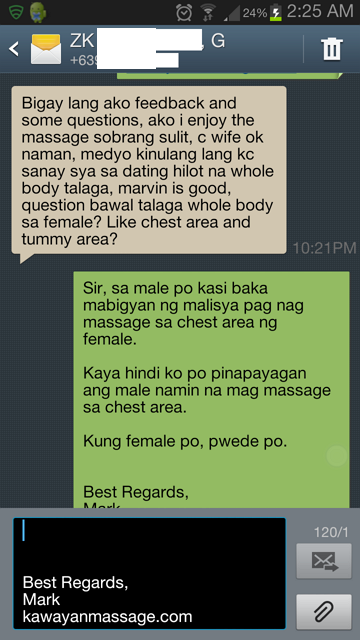 Kawayan Massage is in need of three (3) MOTORCYCLE RIDERS. 4. unli-rice — YES, UNLI RICE! 5. bring resume or biodata. mas maige kung may dala nang BARANGAY CLEARANCE, POLICE CLEARANCE at NBI CLEARANCE para start agad. 6. Apply daily from 1pm to 6pm. We have available masahistas now. Book early to get the time slot you want. Thank you to all our Clients! Kawayan Home Massage Service is HIRING Female Therapists! We are now serving MANDALUYONG and nearby areas! Make your day more AWESOME! We’re HIRING! Interview on TUESDAY, May 2, 2017, 2PM, to start ASAP!